On June 23rd, 2017 the Belgian Air Force Air Traffic Control Center (ATCC) at Gavere-Semmerzake organized its bi-annual Open Door. 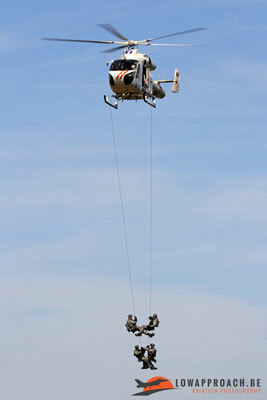 During the day the many visitors were treated to a nice mix of activity on the ground and in the air. 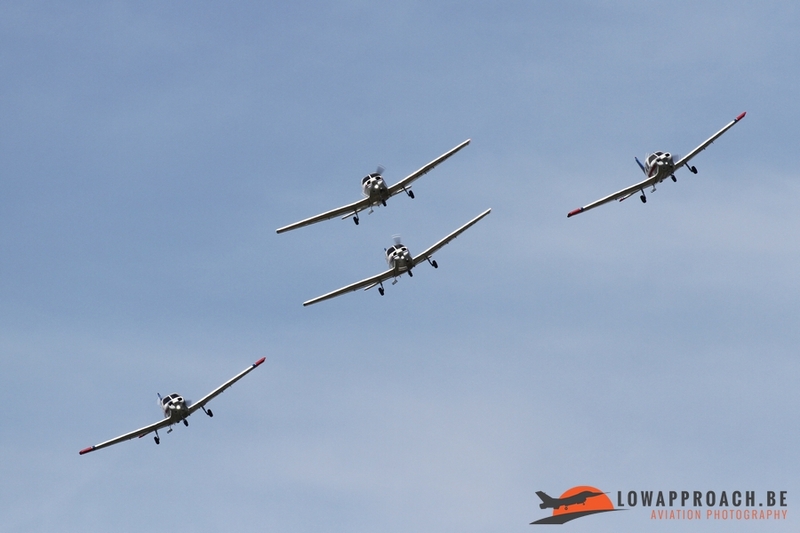 The perfect weather allowed the many enthusiasts to capture the events in ideal conditions. As the ATCC doesn't have a runway, the aerial activity consists mainly of a number of fly-bys and demonstrations. 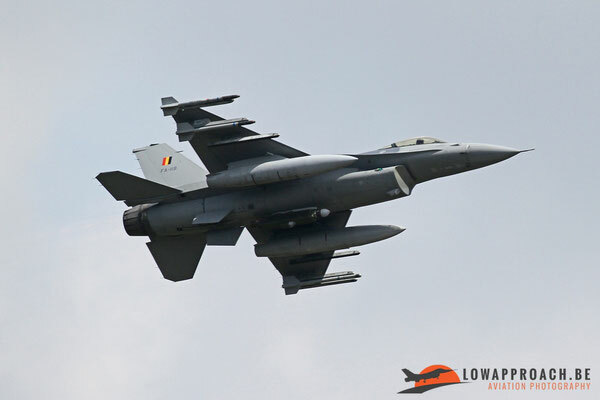 Main contributor of the flying is off course the Belgian Air Force itself. 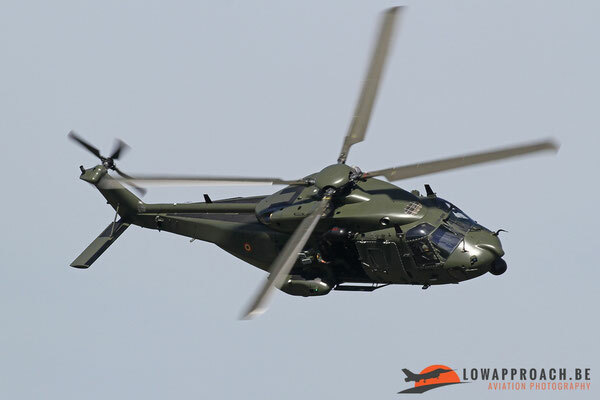 During the day we saw a large number of types currently in service overflying the area. 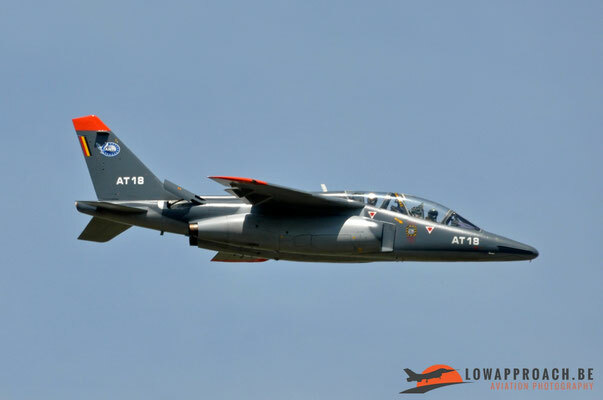 The first type we saw was a Dassault-Breguet Alpha Jet 1B+, normally based at Cazaux, leading a formation of Lockheed-Martin F16AM Fighting Falcon from 2 Wing at Florennes. 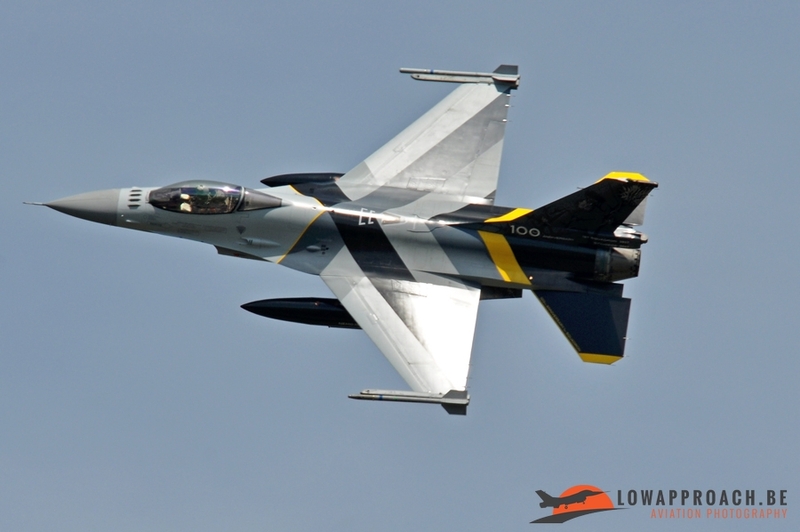 One of the F-16’s was the FA-132 which received a special color scheme to commemorate the 100th Anniversary of 1 'Stinger' Squadron. 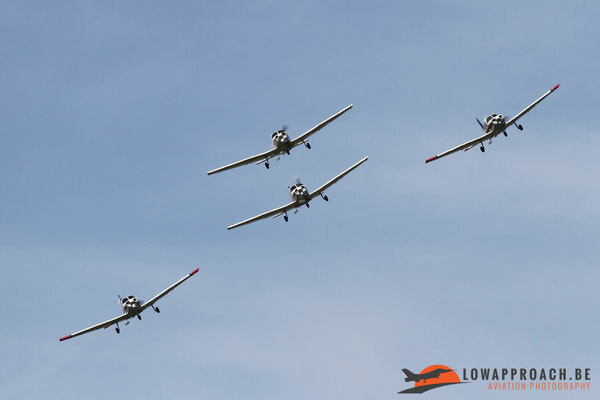 1 Squadron was created in 1917 during the First World War, which was fought in the area of the ATCC. 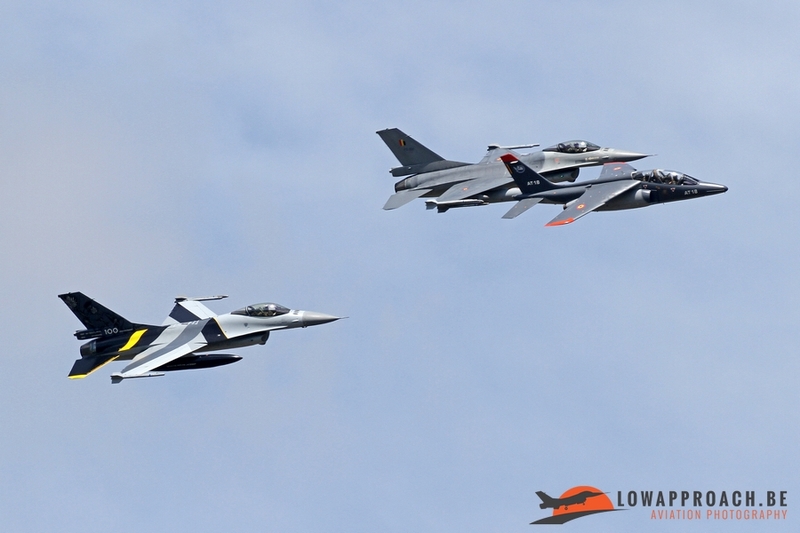 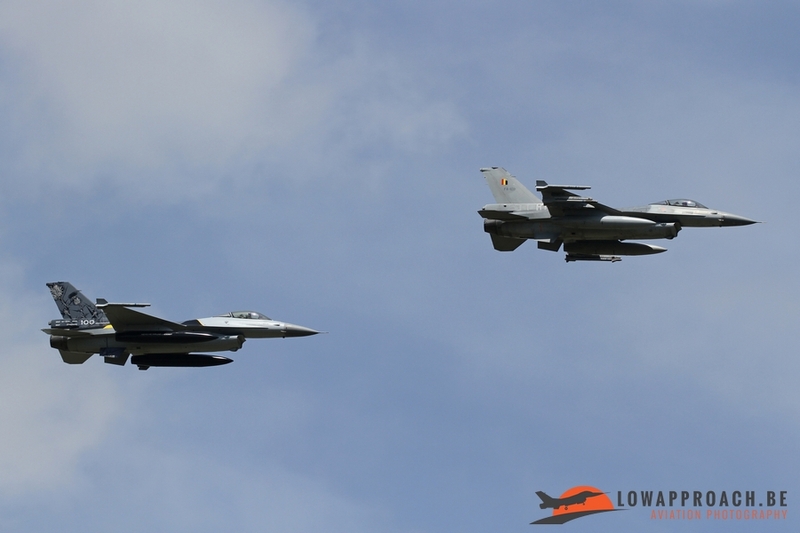 To finish their display the F-16’s also performed a number of base attacks. 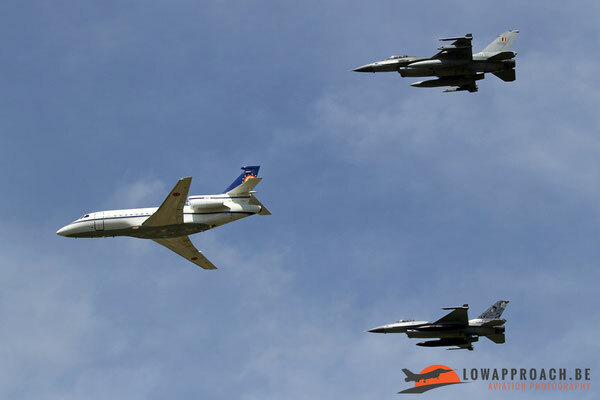 Later in the afternoon another formation arrived in the shape of a Dassault Falcon 900B from 21 Squadron, part of 15 Wing, based at Melsbroek. 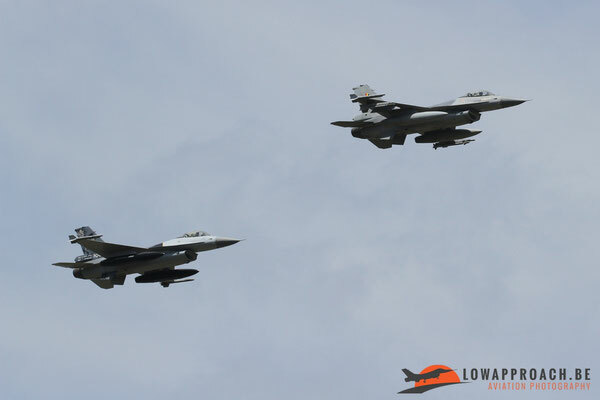 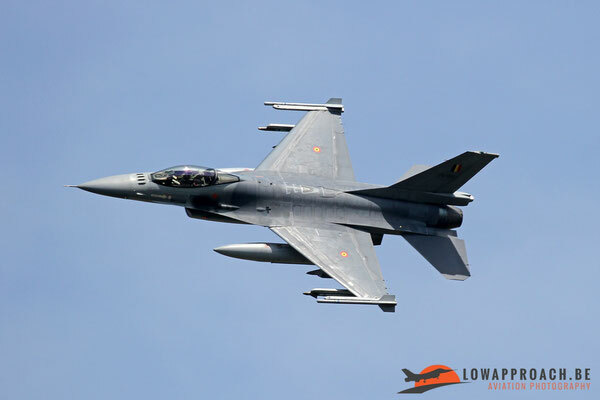 It was again accompanied by the F-16’s from Florennes. 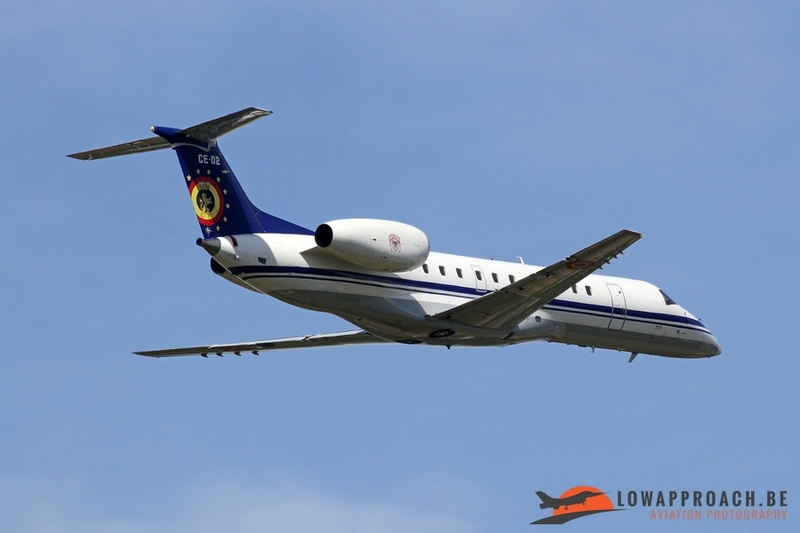 The days of the sole Belgian Air Force Falcon 900B are numbered as it is scheduled to be withdrawn from service at the end of 2018. 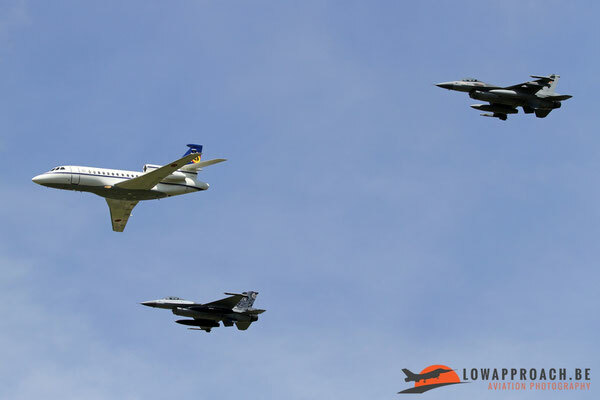 The Falcon 900B was not the only aircraft from 15 Wing that was present at Semmerzake. 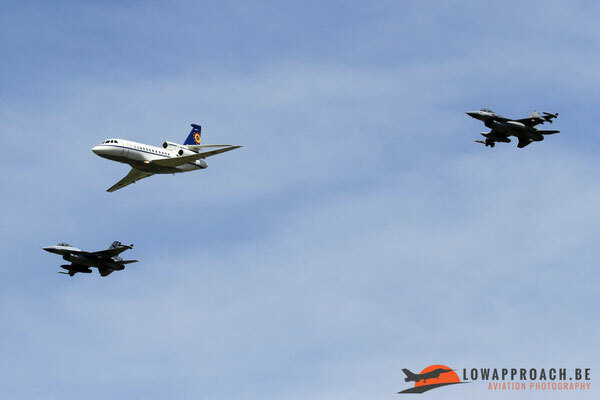 21 Squadron also send an Embraer ERJ-135, which after one pass continued its way to Ursel, were it participated in the local fly-in. 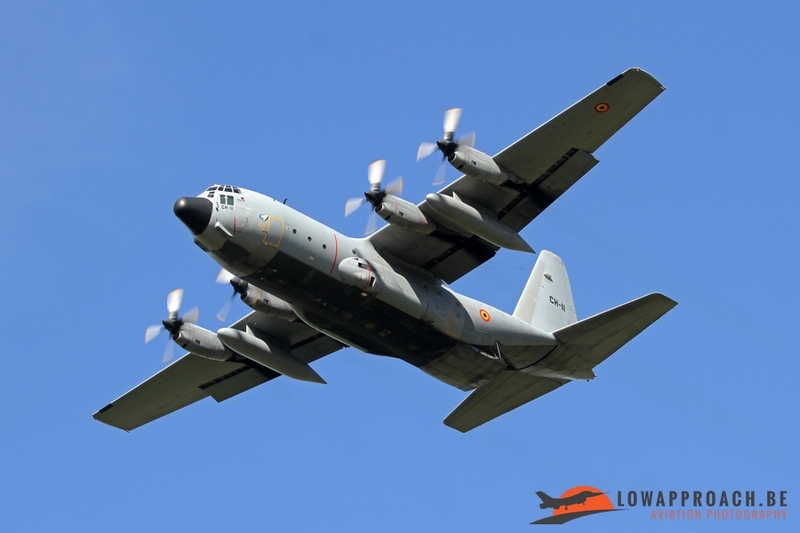 The other unit forming 15 Wing, 20 Squadron, send over one of its Lockheed C-130H Hercules transport aircraft. The visit of this aircraft was a surprise for many, as in the weeks before the event the complete fleet was grounded due to some technical problems. 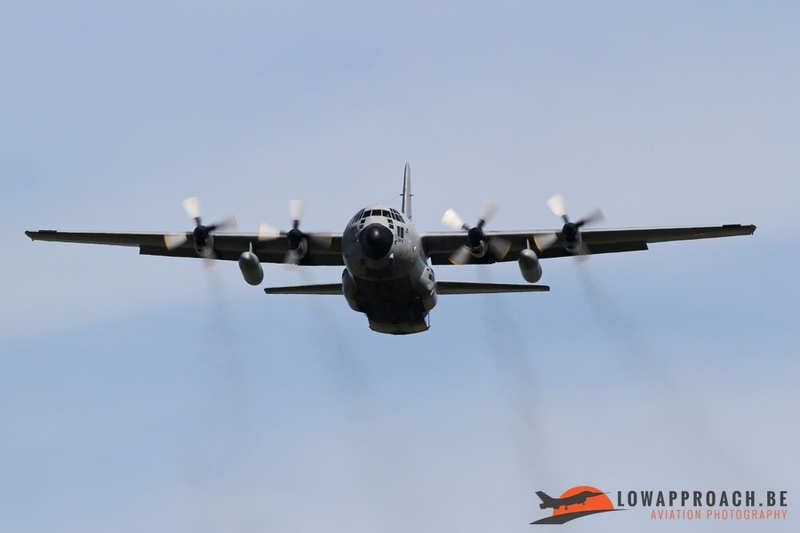 It was great to see one of our grey giants back in the air! 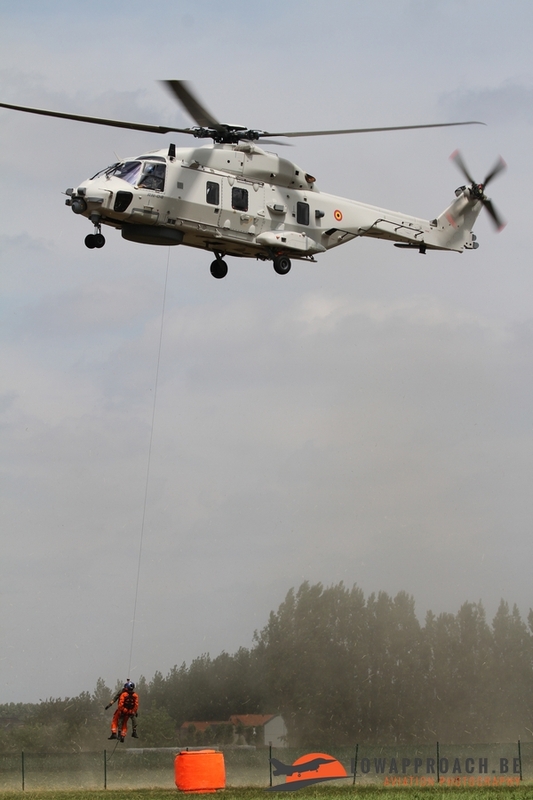 As Semmerzake doesn't have its own runway, most action has to come from the present helicopters. 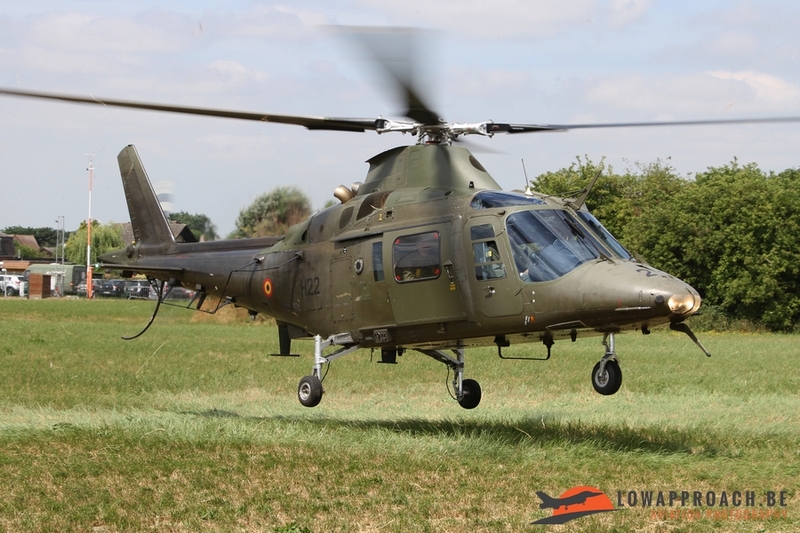 Virtual all the types in service with the Belgian Air Force were present on the day, the sole exception being the Alouette III. 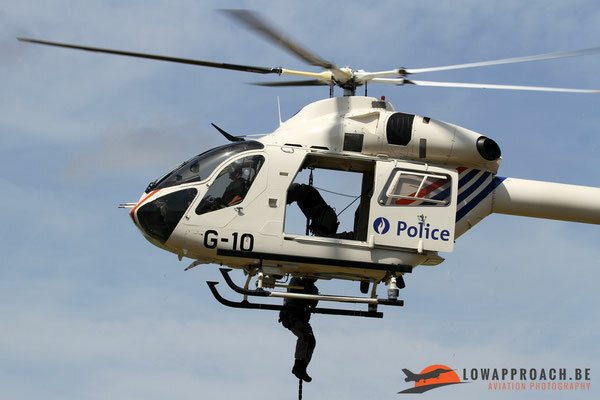 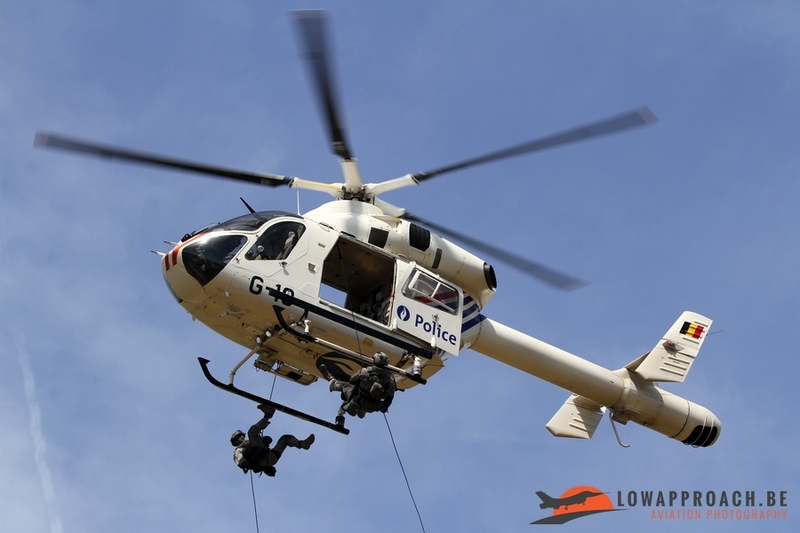 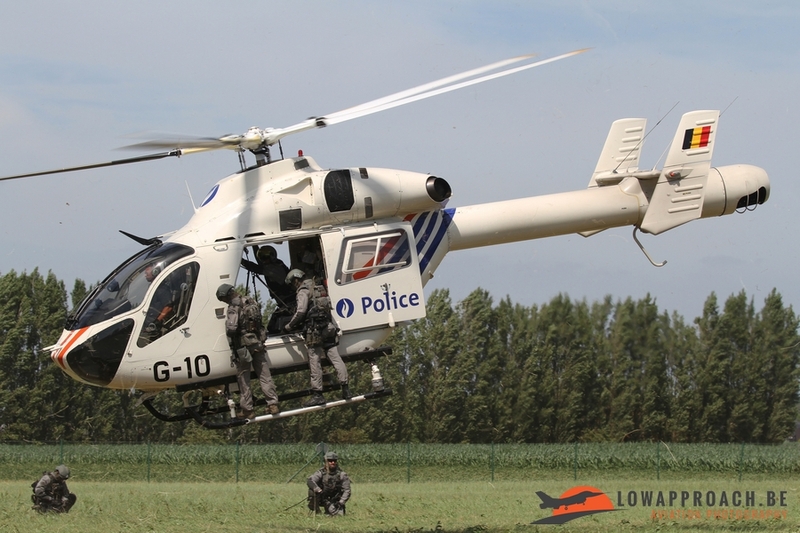 However the first type we saw in action was not an Air Force example, but the MD Helicopters MD902 Explorer from the Belgian Federal Police. 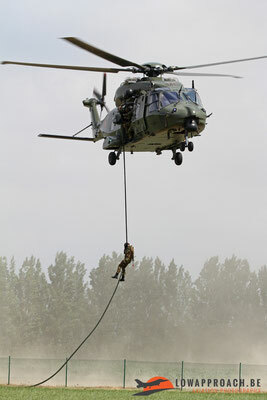 Twice during the day it did its demo supported by the people from DSU, the Special Intervention Unit of the Police. 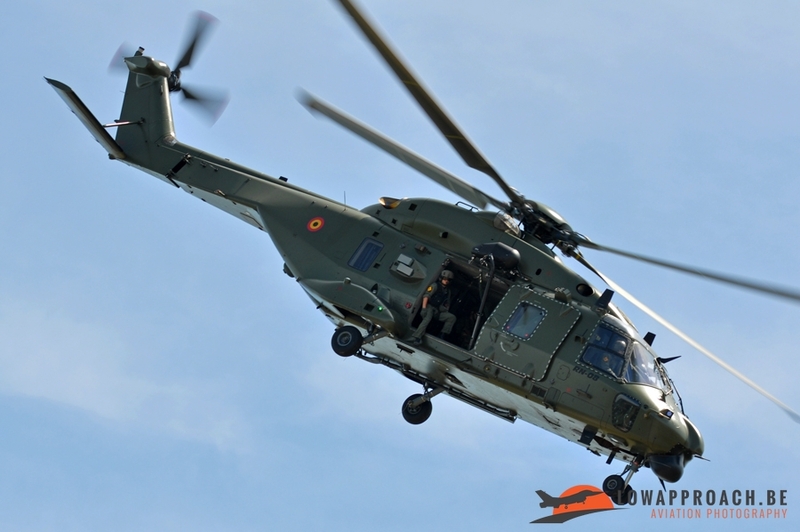 The next helicopter demo came from the Airbus Helicopters NH-90TTH from 18 Squadron, part of 1 Wing, based at Beauvechain. 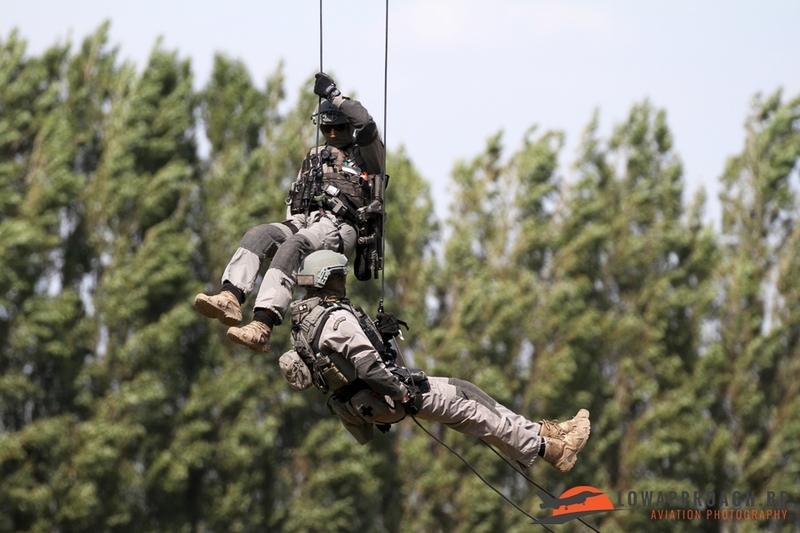 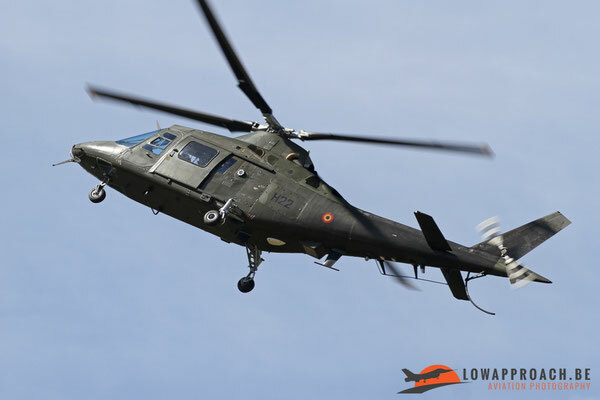 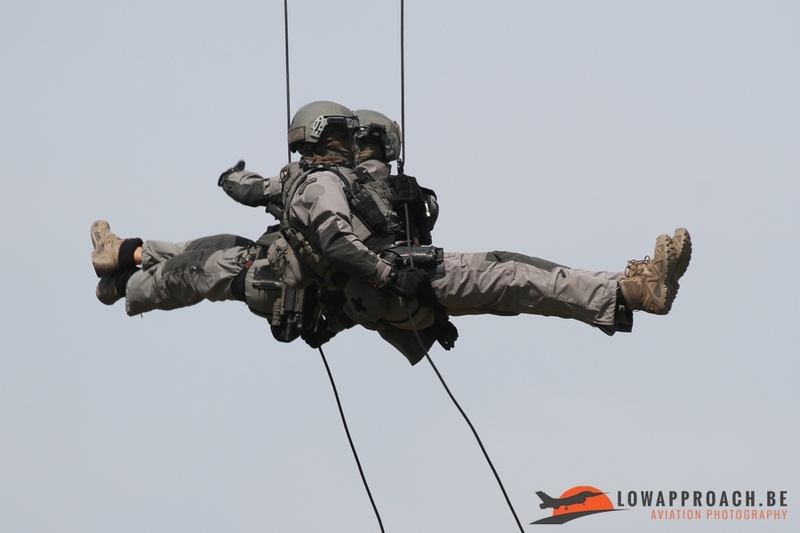 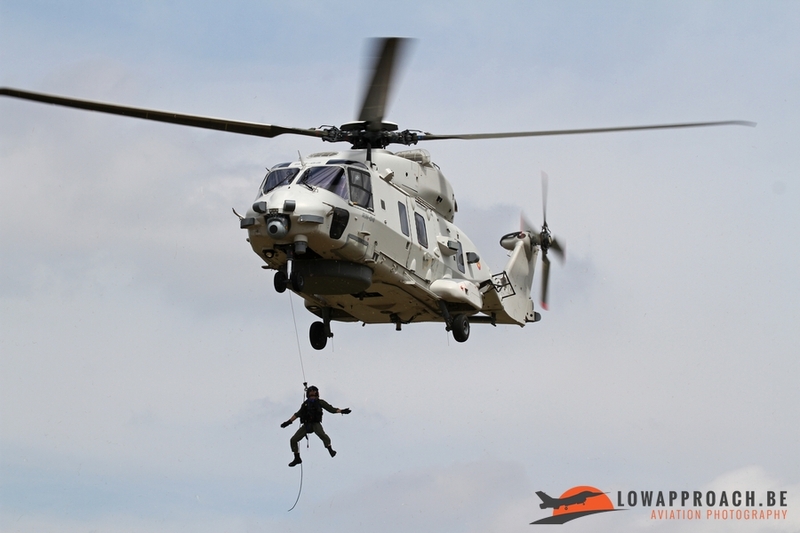 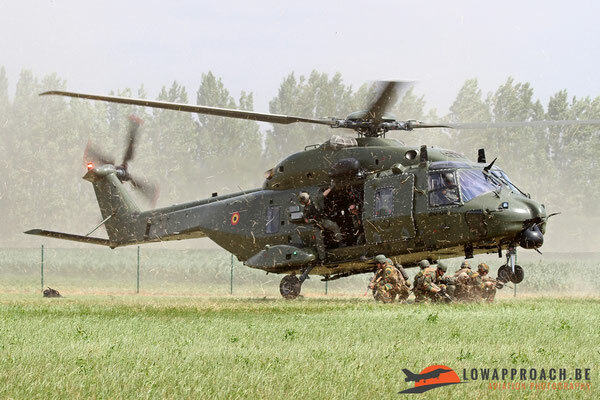 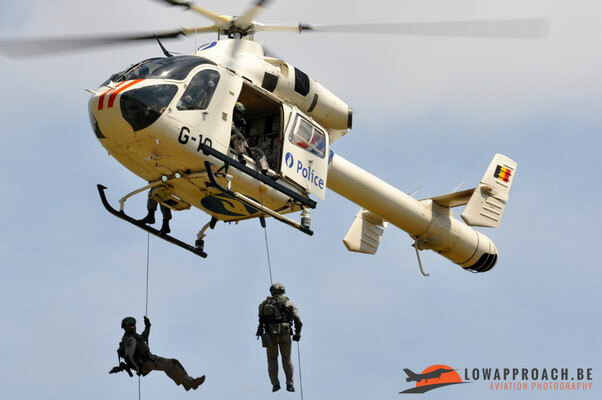 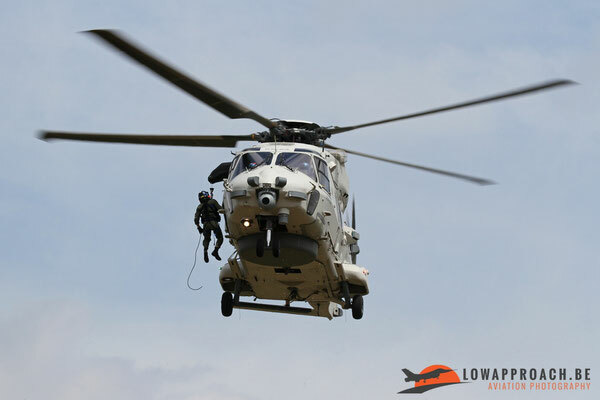 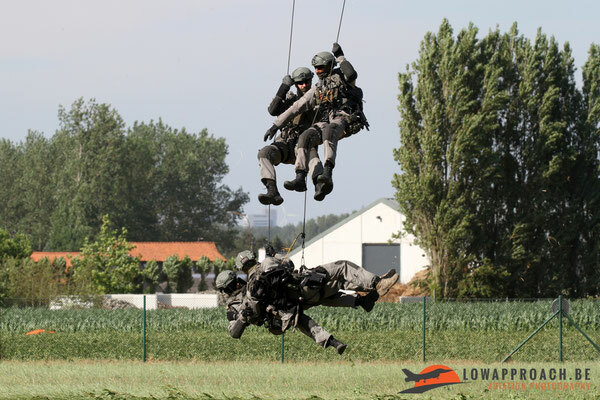 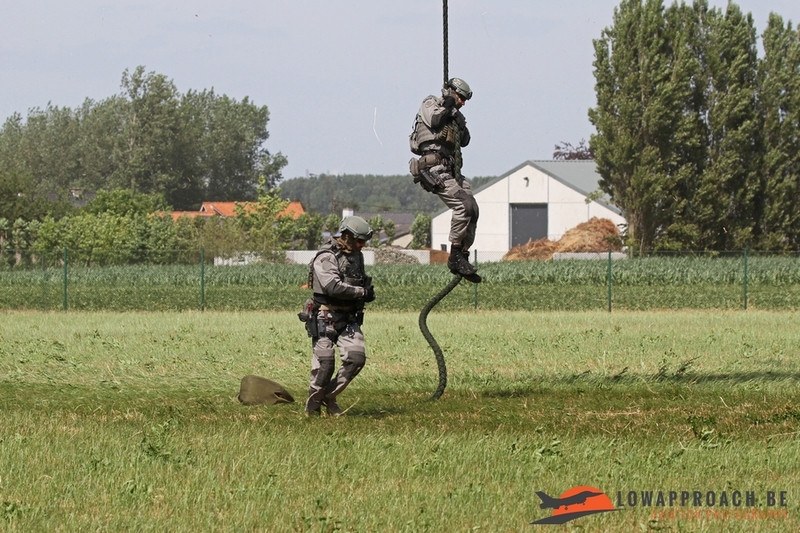 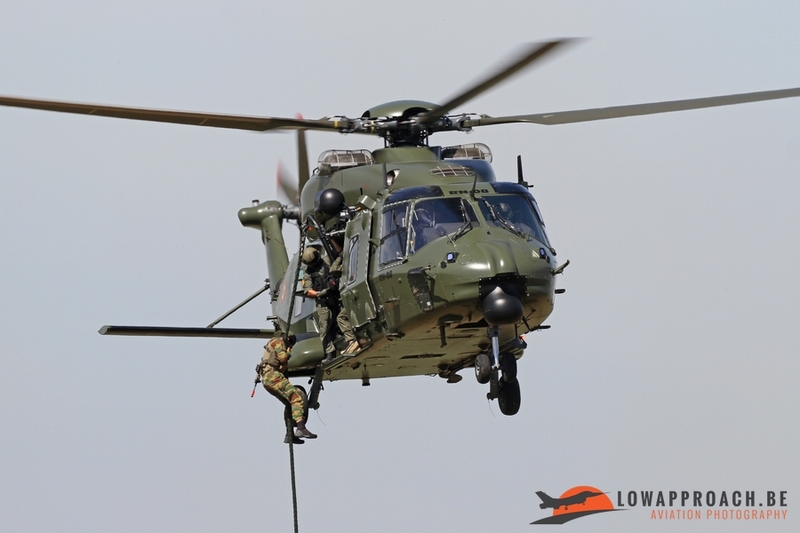 They did a demo, similar to the MD900 one, but this time supported by troops from the Belgian Army Special Forces. 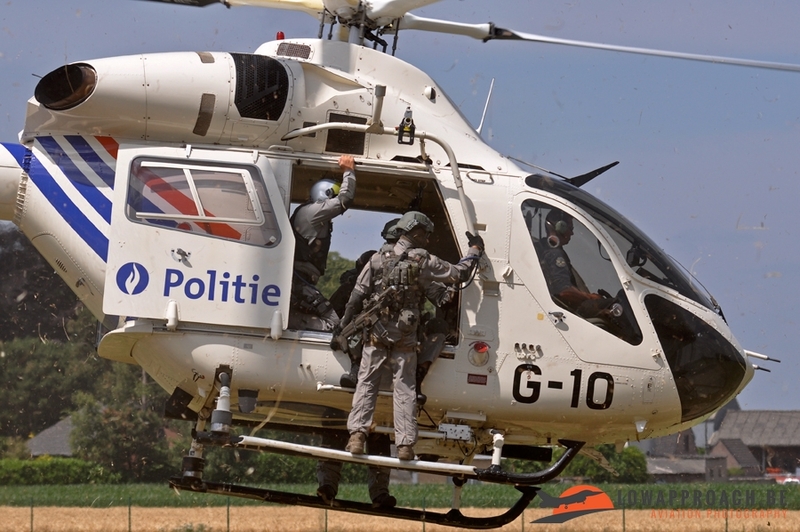 The scenario was that a 'bad guy' in a van had to be stopped, arrested and evacuated by the unit. 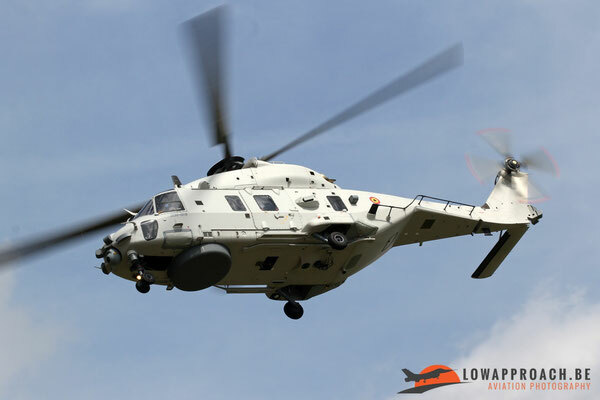 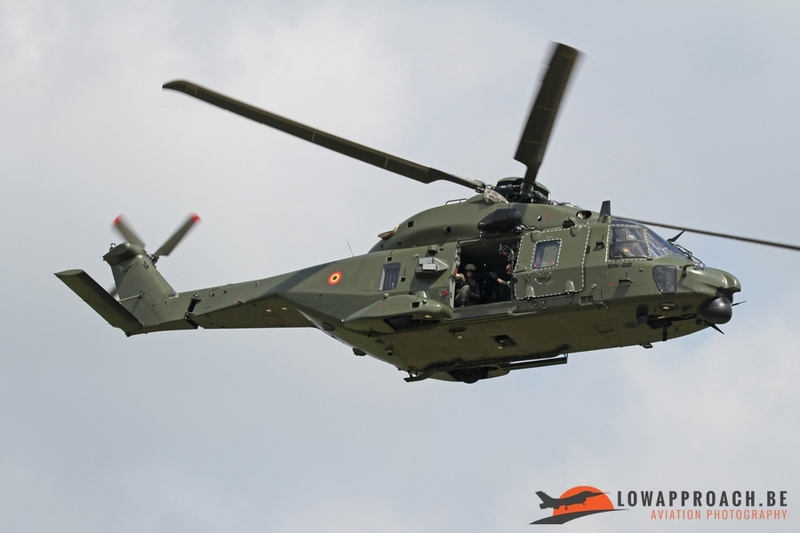 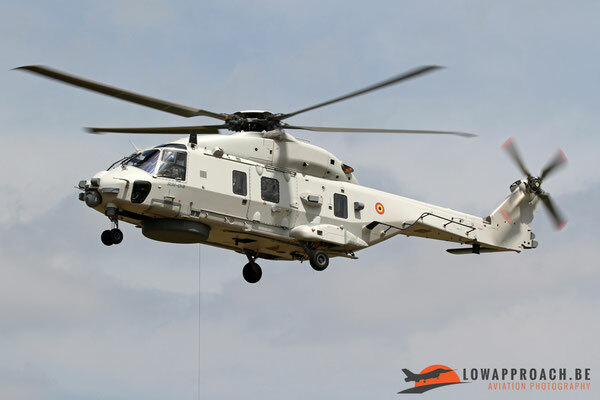 The NH90TTH was shortly followed by its Naval variant, the NH-90NFH, from 40 Squadron, based at Koksijde. 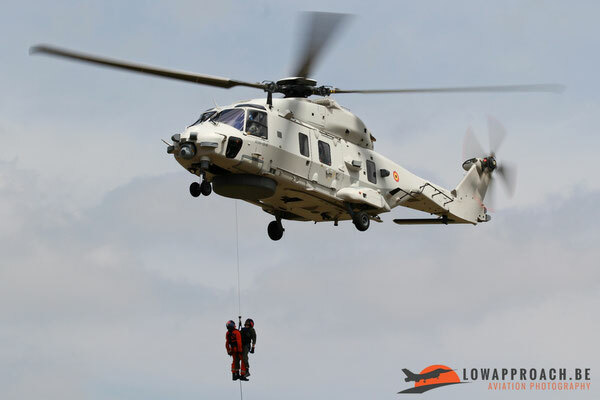 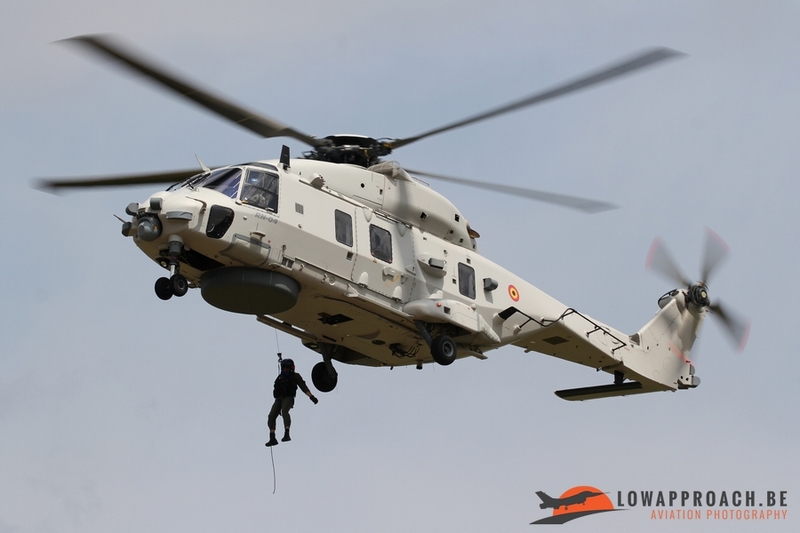 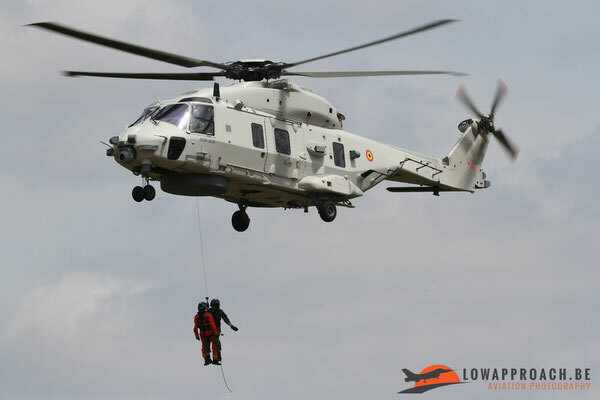 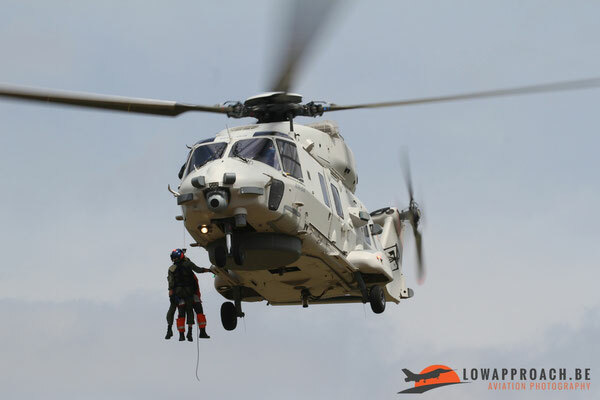 The NH-90NFH is the successor of the Westland Sea King Mk48 in the Search-and-Rescue role, the role it demonstrated during the event. 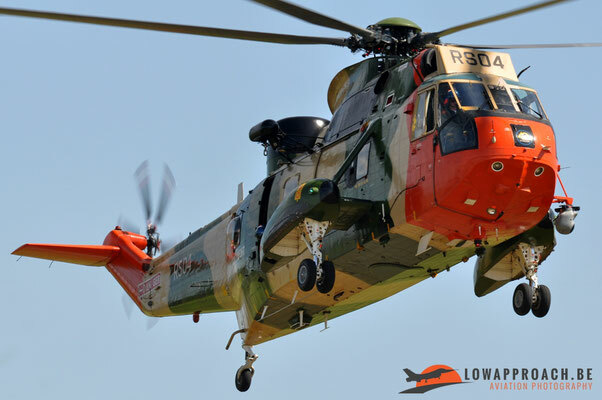 40 Squadron was kind enough to bring the latest (and last) arrival in the fleet, RN04, which was delivered three months earlier. 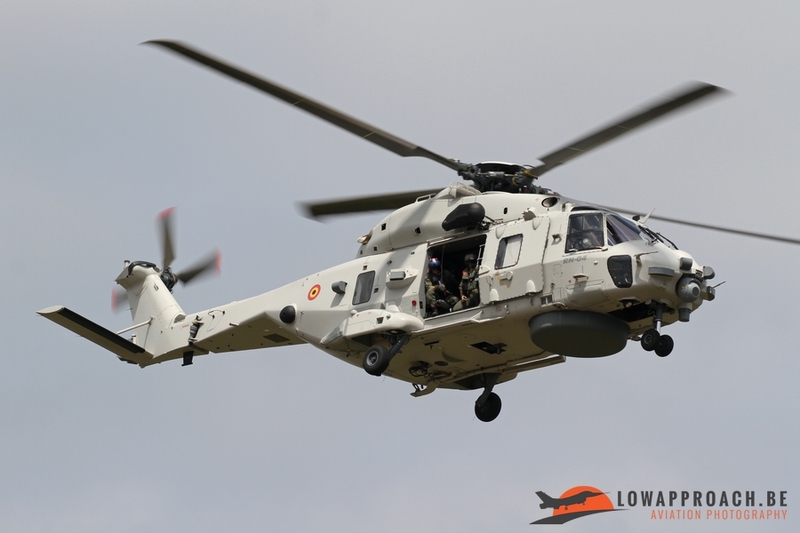 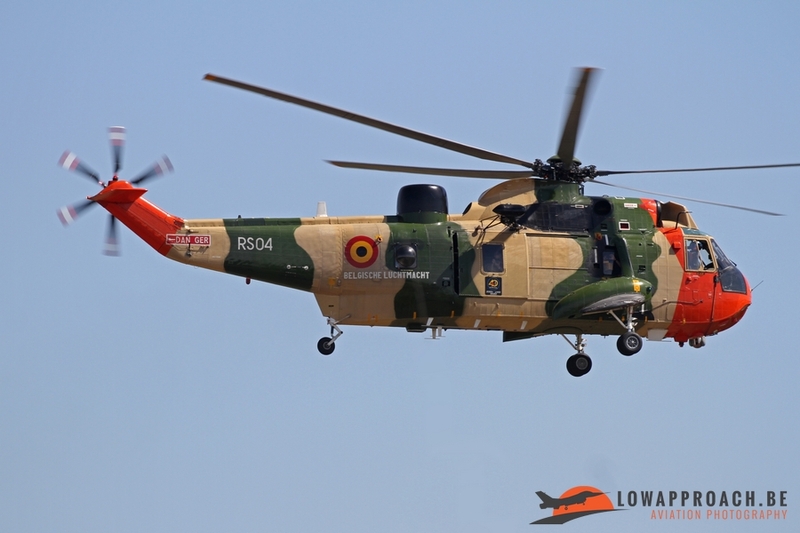 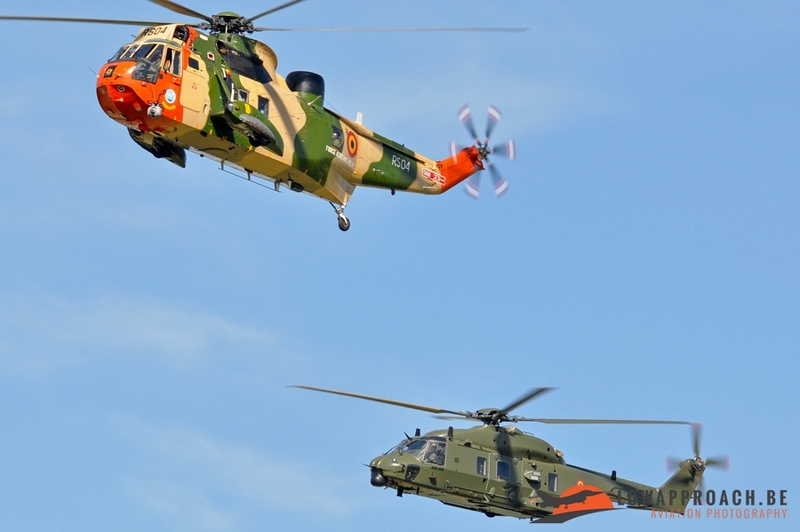 The predecessor of the NH-90NFH, the Sea King, was also present but stayed on the ground the whole day. 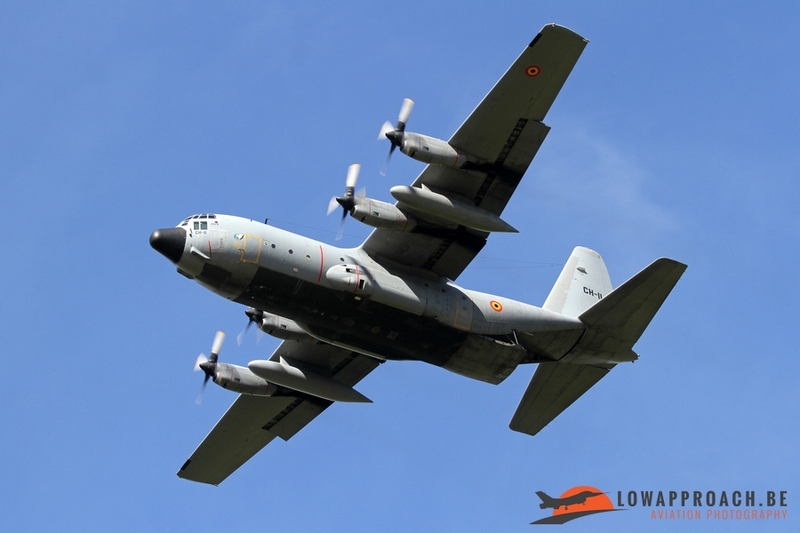 We only saw it airborne when it departed towards Ursel, were it participated in the annual fly-in the following weekend. The final Belgian Air Force helicopters we saw were a couple of Agusta A-109UH Hirundos, one of which provided some flights with spectators who won a competition. 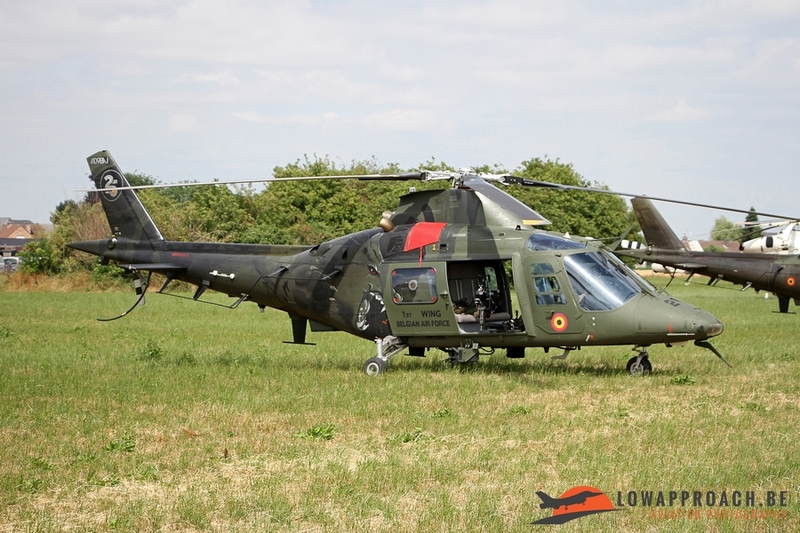 The second A-109 was the specially painted Demo-example, but unfortunately it didn't flew during the event. 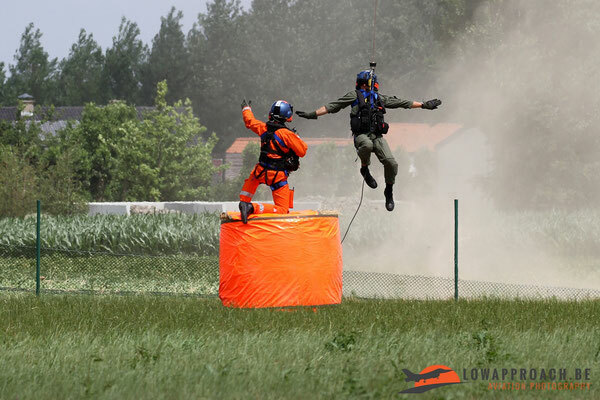 The event also provided two demonstrations from Belgian demo-teams. 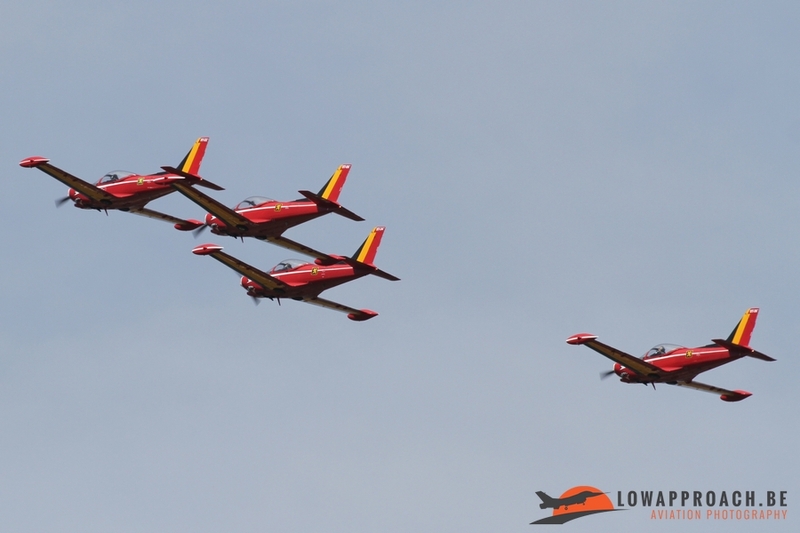 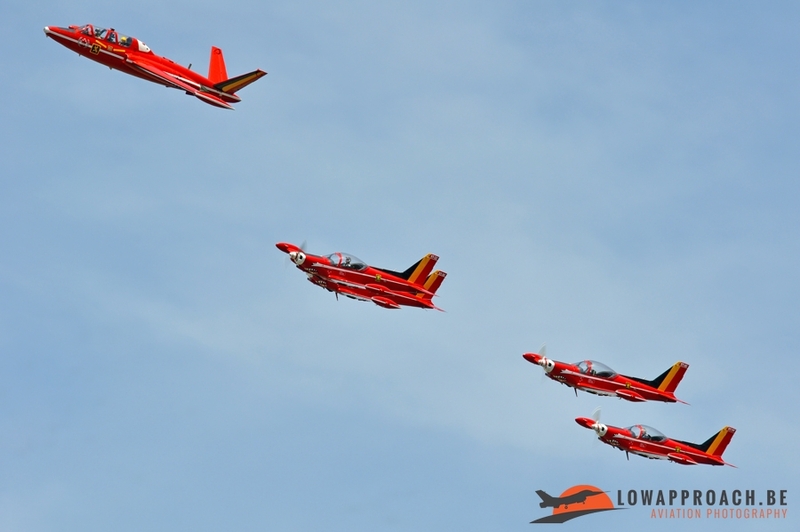 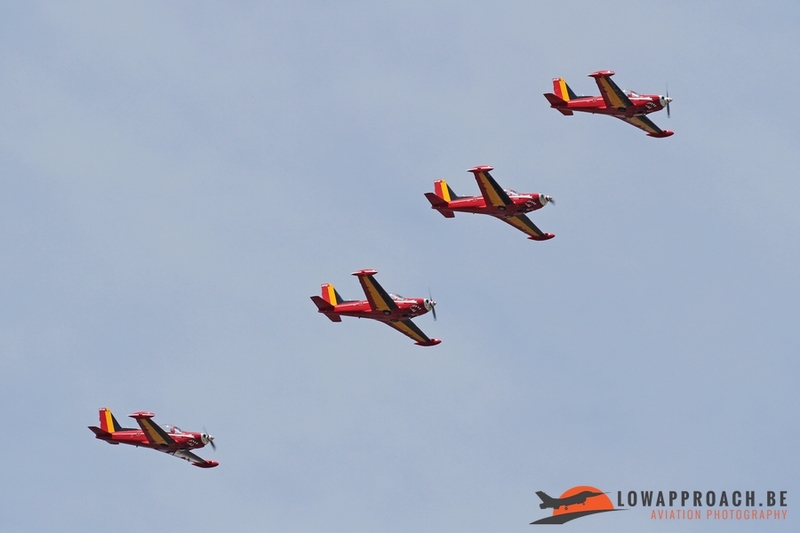 The first one was the Belgian Air Force Red Devils team. 2017 was a special year for the team as they celebrated their 60th Anniversary. It was created in 1957, then equipped with the Hawker Hunter, the unit disbandment in 1963. 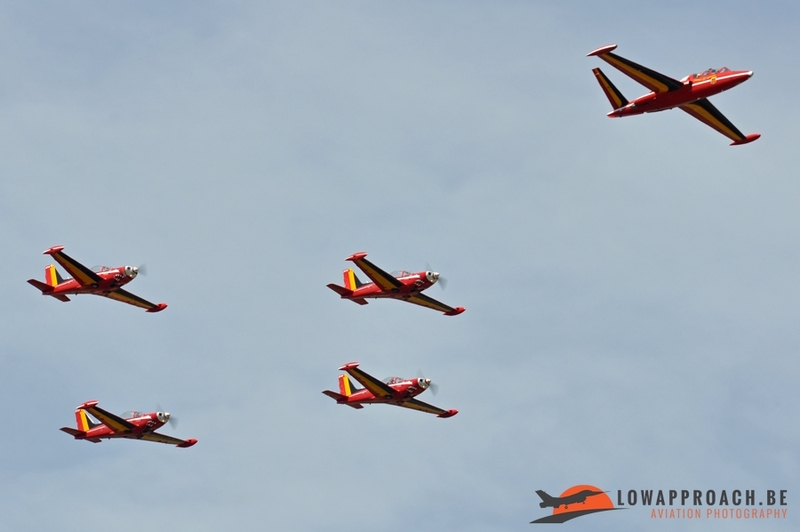 In 1965 it was reformed this time flying the Fouga CM170R Magister, which had entered service a few years earlier. 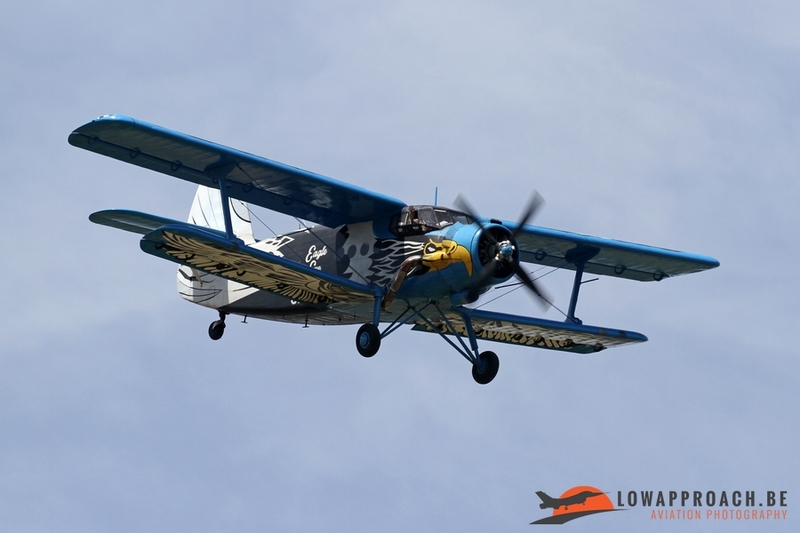 In 1977, due to budgetary reasons, it was disbanded again. 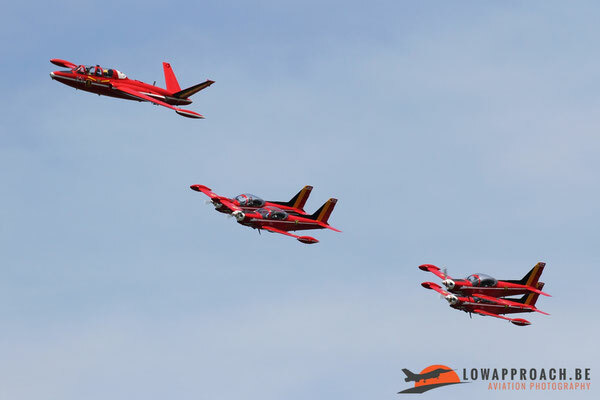 In 2011 they were back, when the Hardship Red-team, formed in 2009 with the Siai-Marchetti SF260M, was baptized 'Red Devils'. 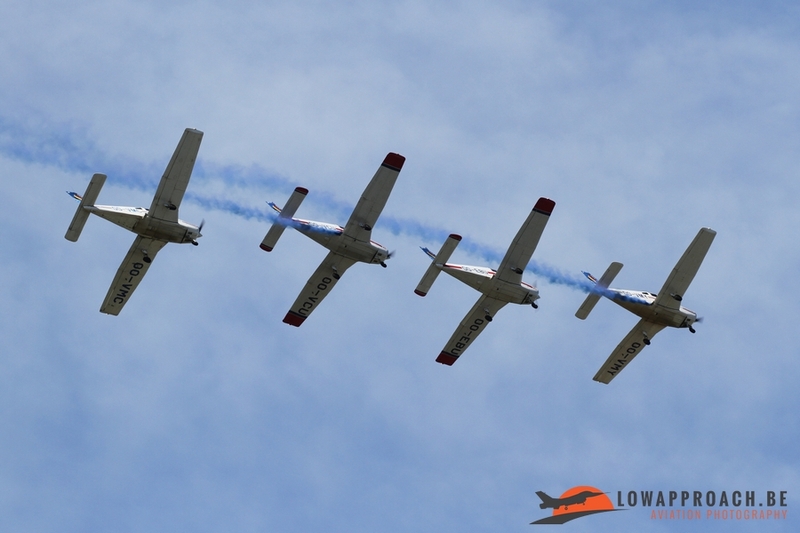 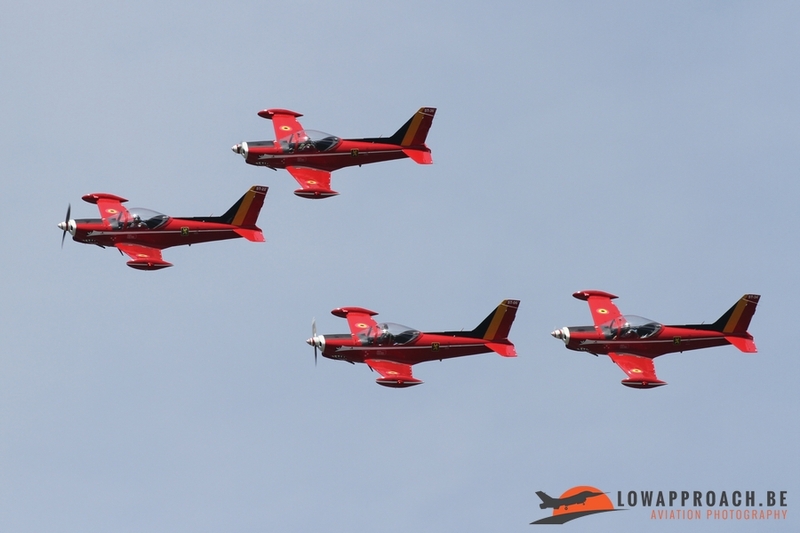 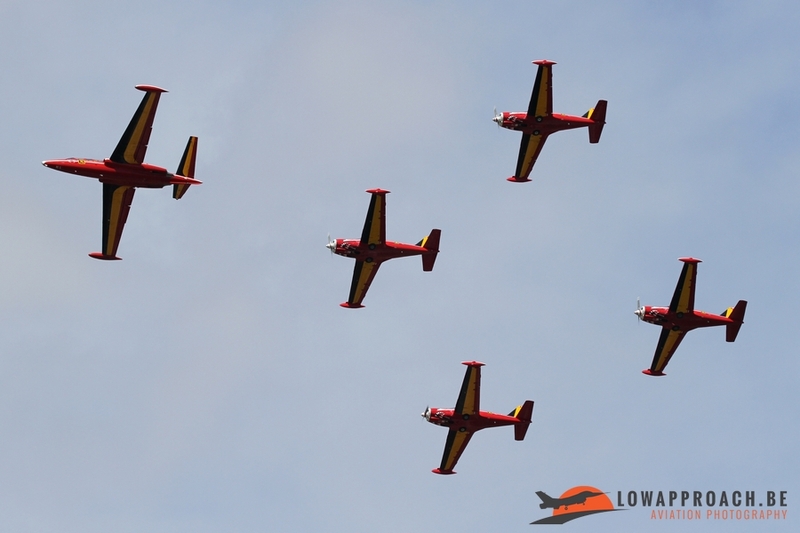 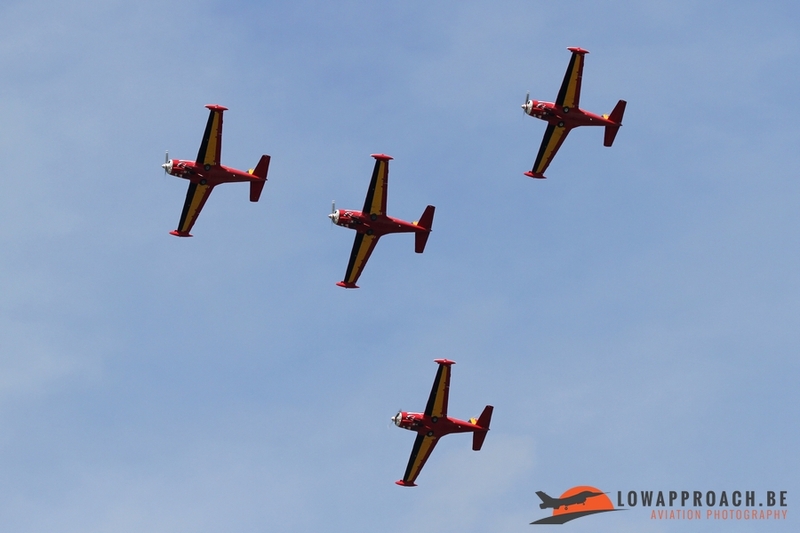 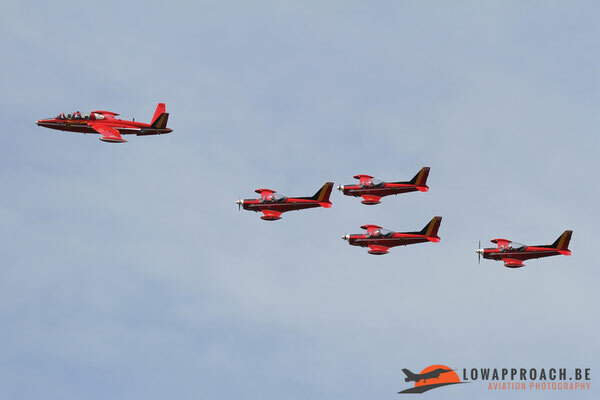 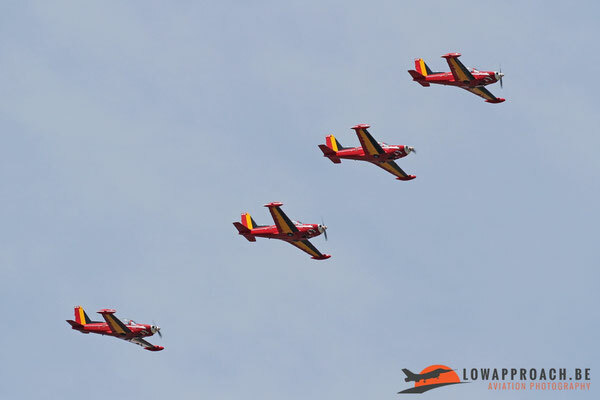 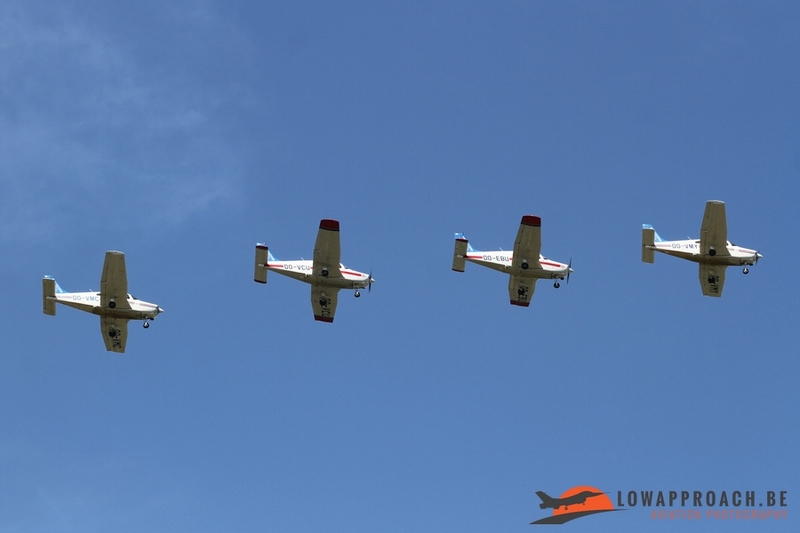 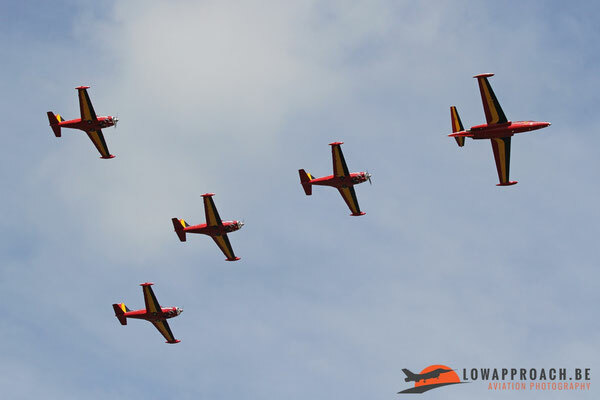 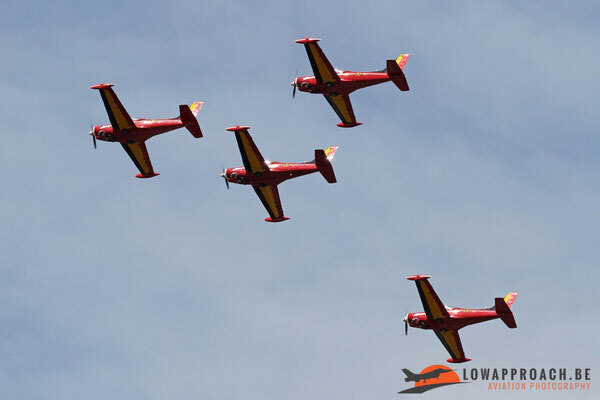 The team started it display at Semmerzake with a number of formation passes with the sole airworthy Fouga Magister in Belgium, MT-5, which is still wearing the Red Devils colors it wore during its days with the team in the early seventies. This Fouga, with the civil registration N216DM, is currently operated by the The Stampe Museum at Deurne, Antwerp. 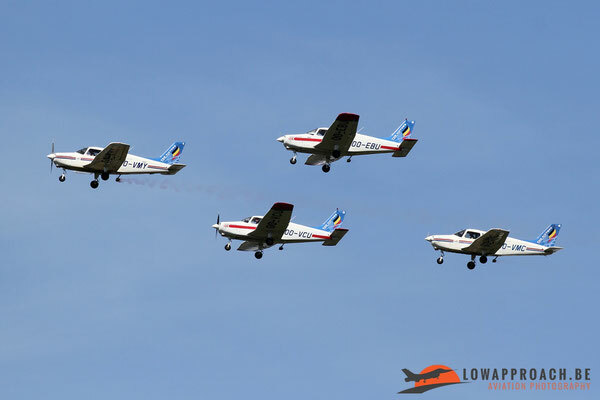 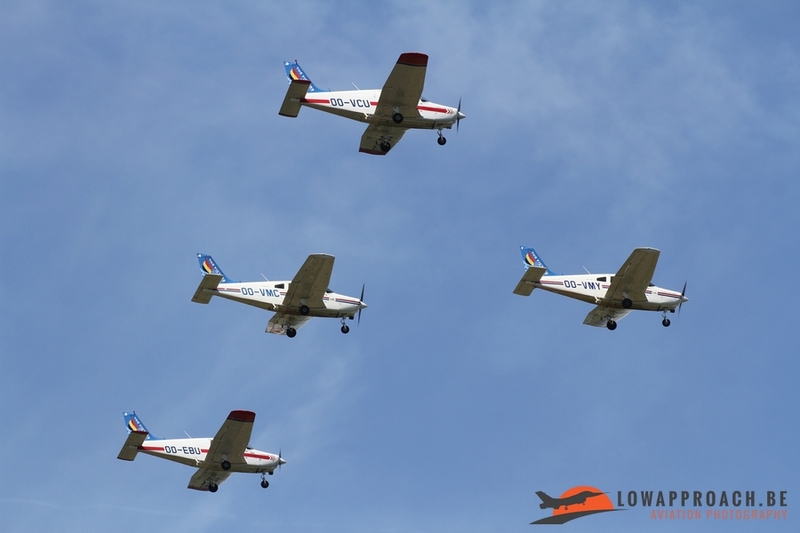 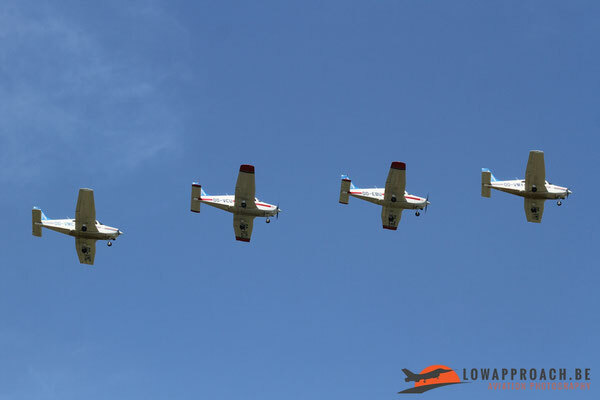 The second team performing at Semmerzake were 'The Victors', the only civilian demo-team in Belgium, using four Piper PA28s. They were formed in 2004 and since then they perform at regular intervals at aerial events in the country. 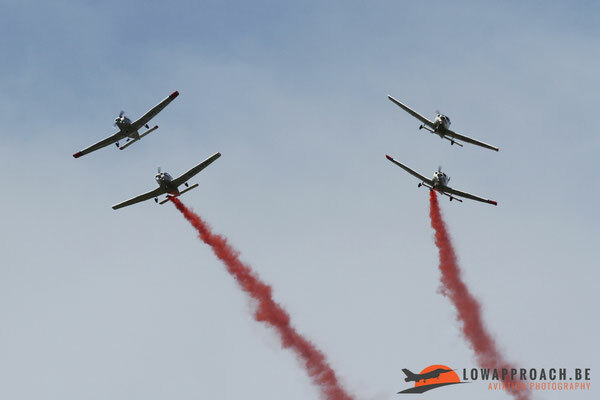 Recently they added some smoke effects to their flying routine which makes their show even more spectacular. The Open Door organized on the Friday preceding the Ursel Fly-In, which provided a few nice visitors at Semmerzake. 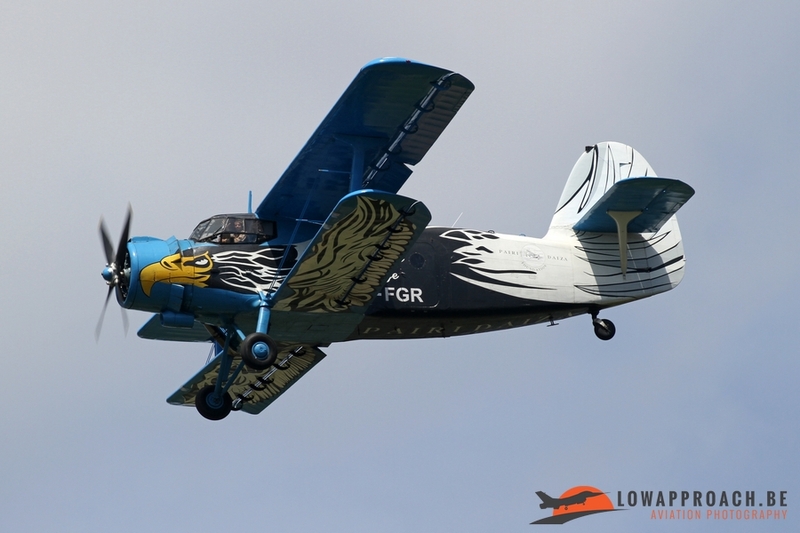 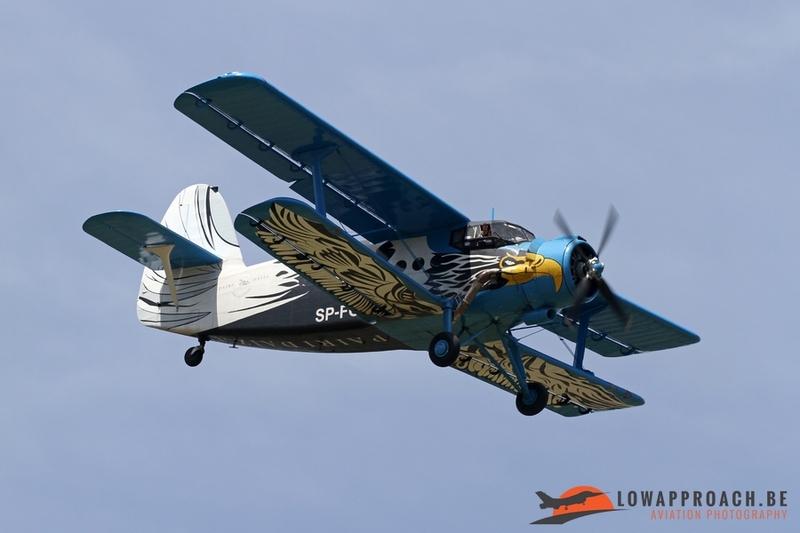 The first one was an Antonov An2 Colt bearing the color scheme of the Pairi Daiza Foundation. 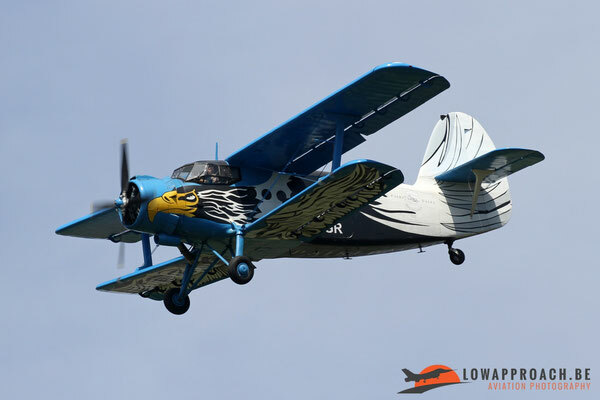 Pairi Daiza is a Belgian Zoo best known for the presence of a couple Panda bears and their new-born offspring. Pairi Daiza recently set up a Foundation, which aim is to support a number of worldwide projects related to the protection of animals and the environment they live in. 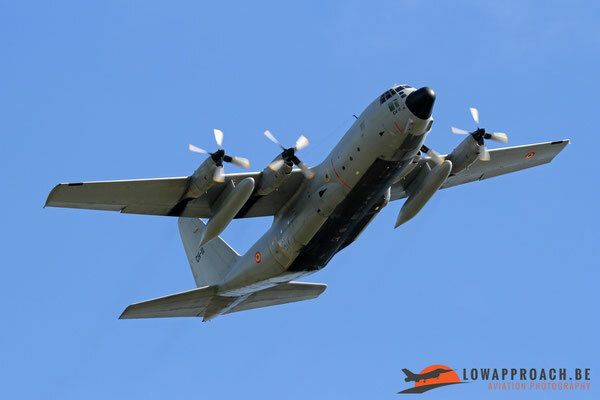 The Antonov is scheduled to move to Africa or Asia shortly to help with the transport of supply goods to support the various projects. 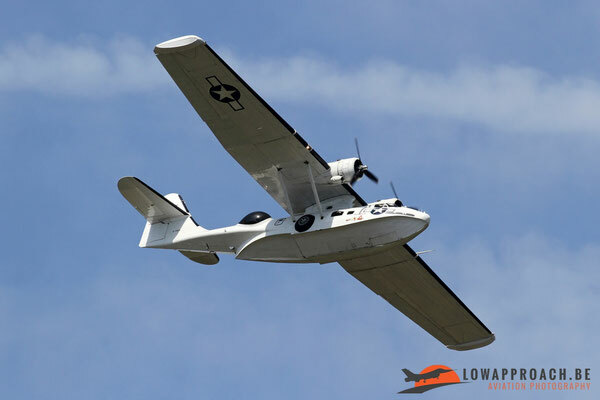 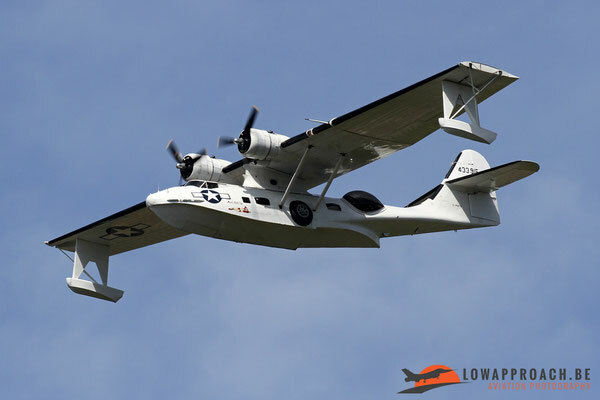 Another fly-by was provided by a Consolidated PBY5A Catalina from The Catalina Society, based at Duxford in the United Kingdom. 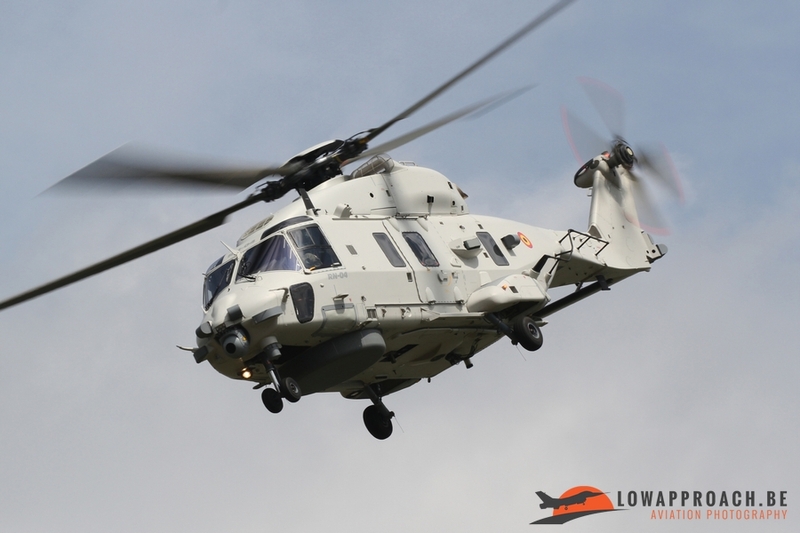 As always the Open Door at Semmerzake is small but very nice event. Photo conditions are very good, with the sun in the back the whole day. 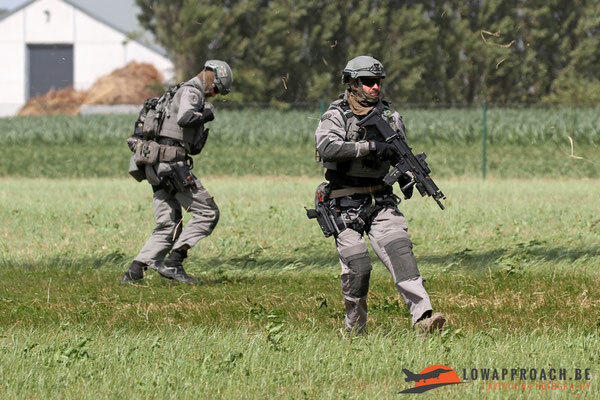 Until now it was organized every two years, but what will the future bring? 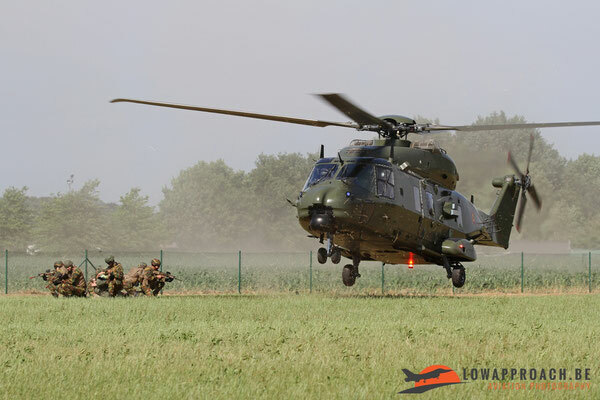 On October 5th, 2017 the Ministry of Defense confirmed the fear of many, in 2020 the ATCC will close its doors for good. 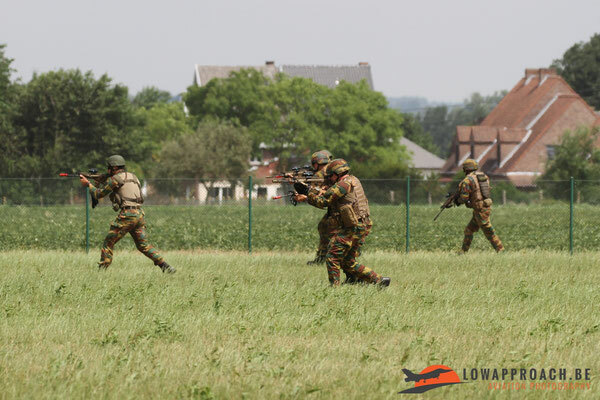 Part of the personnel will transfer to the Eurocontrol site at Brussels and the remainder will be spread over other locations in the country. 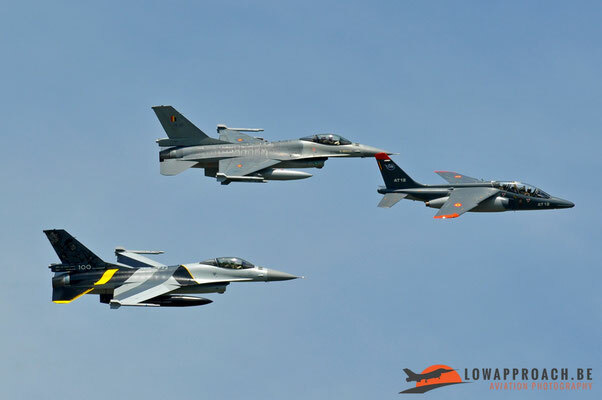 In theory there is still an occasion for another Open Door in 2019, but if it actually will take place, is still unknown.